Congratulations to the Guys for doing well in the mens sabre of he Cambridge winter tournament, with Bryn taking second place and Rowan coming in 8th! Craig December 20, 2017 December 20, 2017 No Comments on Farewell to Chris! Rebecca August 29, 2017 August 29, 2017 No Comments on Congratulations Bryn & Varia! The World Record Update You’ve Been Waiting For! Rebecca February 22, 2017 February 22, 2017 No Comments on The World Record Update You’ve Been Waiting For! WORLD RECORD: DID WE DO IT? 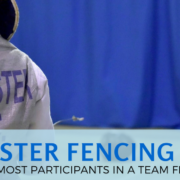 At 9am on Sunday 14th August we set up an Olympic-style Piste (courtesy of Leon Paul) in the café of Leicester’s Curve Theatre, from there we broke the Guinness world record MOST PARTICIPANTS IN A TEAM FENCING EXHIBITION MATCH. Banner photos credit: Robin Palmer 2015.